While origami results in some pretty incredible paper animals, no folded crane can hold a candle to these intricate and insanely accurate creatures created by Chie Hitotsuyama. The Japanese paper artist gives everyday newspaper a new life by folding, rolling, and stacking it into the form of some of the world’s most recognizable animals, and some of her paper creations are practically life-size. Over the past four years, Hitotsuyama and her team have worked to create lifelike paper creatures with staggering accuracy. After wetting the newspaper, they twist, fold, squish, and roll it, and then bind it into the desired form. The artist builds paper sculptures representing everything from manatees to monkeys, including some endangered animals such as rhinoceros and sea turtles. Hitotsuyama even takes advantage of color-printed newspapers in some sculptures, using the gradations to mimic the animal’s actual coloring. Every inch of every intricately bound animal sculpture is made entirely by hand. Each carefully sculpted paper animal takes hours upon hours to create, even with a team effort. Although the photographs of the sculptures are incredible, getting a chance to see the nearly life-size paper animals up close would certainly be an awe-inspiring way to spend an afternoon. Some of Hitotsuyama’s sculptures are currently on display at MOAH:CEDAR in Lancaster, California through January 7, 2017. It’s worth noting that paper is not a new fascination for Hitotsuyama’s family. They once operated a paper strip manufacturing plant in Fuji city in Shizuoka prefecture, southwest from Tokyo. Now, the artist’s studio is housed in a warehouse connected to that same paper plant. Over the past four years, Hitotsuyama and her team have worked to create lifelike paper creatures with staggering accuracy. After wetting the newspaper, they twist, fold, squish, and roll it, and then bind it into the desired form. 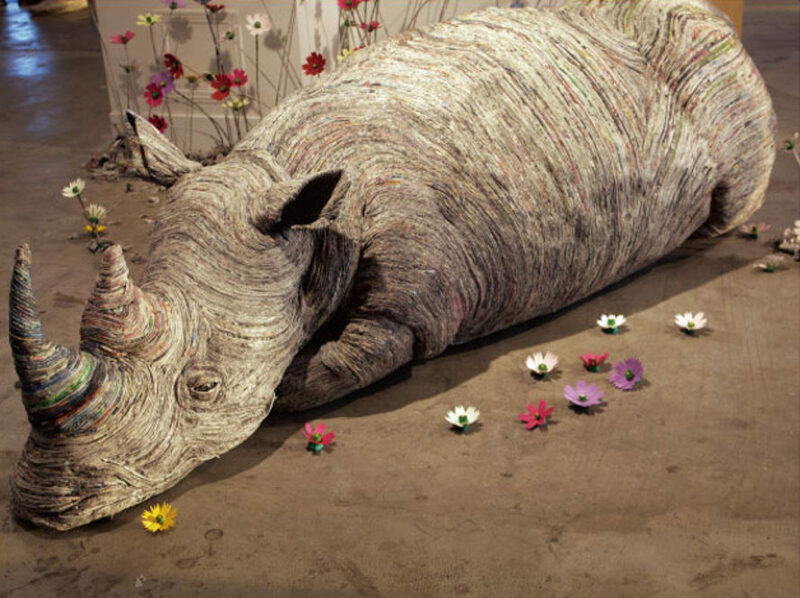 The artist builds paper sculptures representing everything from manatees to monkeys, including some endangered animals such as rhinoceros and sea turtles. 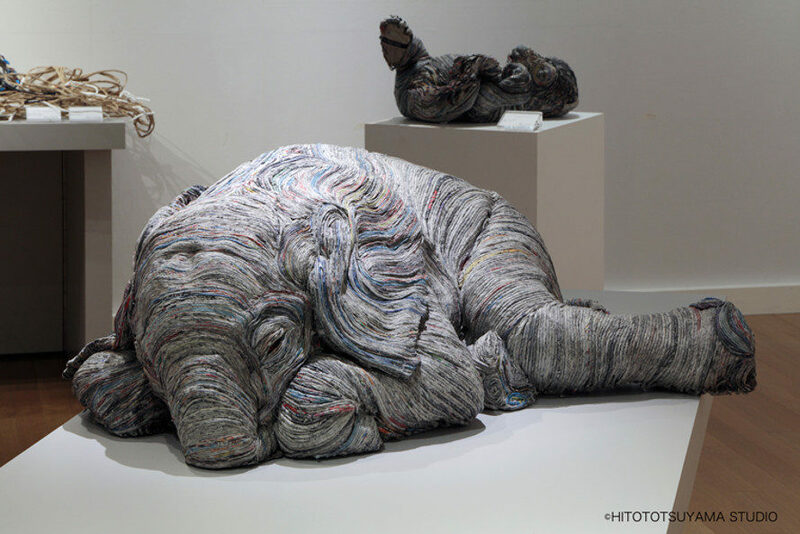 Hitotsuyama even takes advantage of color-printed newspapers in some sculptures, using the gradations to mimic the animal’s actual coloring. Every inch of every intricately bound animal sculpture is made entirely by hand. Each carefully sculpted paper animal takes hours upon hours to create, even with a team effort. Although the photographs of the sculptures are incredible, getting a chance to see the nearly life-size paper animals up close would certainly be an awe-inspiring way to spend an afternoon. Some of Hitotsuyama's sculptures are currently on display at MOAH:CEDAR in Lancaster, California through January 7, 2017. It's worth noting that paper is not a new fascination for Hitotsuyama’s family. They once operated a paper strip manufacturing plant in Fuji city in Shizuoka prefecture, southwest from Tokyo. Now, the artist’s studio is housed in a warehouse connected to that same paper plant.